Astell, Mary, and John Norris. Mary Astell and John Norris: Letters Concerning the Love of God. Edited by Melvyn New, Derek Taylor and E. Derek Taylor. Ashgate Publishing 2005. Conway, Anne, Henry More. The Conway Letters: The Correspondence of Anne, Viscountess Conway, Henry More, and Their Friends, 1642-1684. Rev. with an introduction and new material ed. Marjorie Hope Nicolson, Sarah Hutton. Oxford; New York: Clarendon Press; Oxford University Press, 1992. Conway, Anne. The Principles of the Most Ancient and Modern Philosophy. Cambridge: Cambridge University Press, 1996. Cudworth, Ralph. The Union of Christ and the Church in a Shadow. London: Richard Bishop, 1642. Cudworth, Ralph. A Sermon Preached before the Honourable House of Commons. Cambridge, 1647. 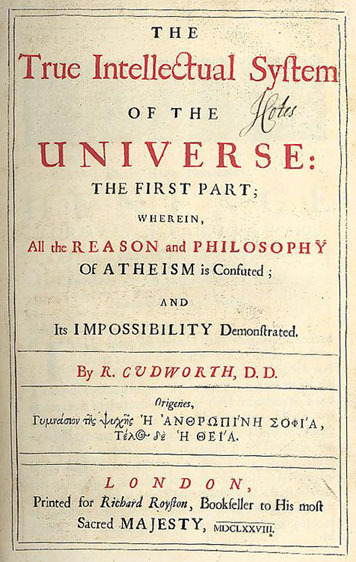 Cudworth, Ralph. The True Intellectual System of the Universe; Wherein All Reason and Philosophy of Atheism Is Confuted and Its Impossibility Demonstrated. With a Discourse Concerning the True Notion of the Lord’s Supper and Two Sermons on 1 John II. 3, 4. and 1 Cor. XV. 57. London, 1678, reprinted Bristol: Thoemmes, 1995; Another edition, 4 vols. London, 1820, reprinted, Elibron Classics, 2005. Cudworth, Ralph. A Treatise Concerning Eternal and Immutable Morality with a Treatise of Freewill Cambridge Texts in the History of Philosophy. Edited by Sarah Hutton. Cambridge: Cambridge University Press, 1996. Culverwell, Nathaniel. Spiritual Optics or a Glass Discovering the Weakness and Imperfection of a Christians Knowledge in This Life. Cambridge: Thomas Buck, 1651. Reprint, Kessinger, 2006. Culverwell, Nathaniel. An Elegant and Learned Discourse of the Light of Nature. London: T.R. and E.M. for John Rothwel, 1654. Reprint, Kessinger, 2006. Glanville, Joseph. Philosophia Pia. London, 1671. Glanville, Joseph. Essays on several important subjects in Philosophy and Religion. London, 1676. Masham, Damaris. Discourse concerning the Love of God. 1696. More, Henry. A Platonicall Song of the Soul. Cambridge, 1642. More, Henry. Philosophical Poems. Cambridge, 1647. More, Henry. An Antidote against Atheism, or an Appeal to the Natural Faculties of the Minde of Man, Whether or Not There Be a God. London, 1652. More, Henry. Enthusiasmus Triumphatus. London, 1656. More, Henry. An Explanation of the Grand Mystery of Godliness, or a True and Faithful Representation of the Everlasting Gospel of Our Lord and Saviour Jesus Christ. London, 1660. More, Henry. Divine Dialogues. London, 1668. More, Henry. Opera Omina. London, 1679. More, Henry. Handbook of Ethics. London, 1690. More, Henry. Handbook of Metaphysics. London, 1690. More, Henry. Henry More: The Immortality of the Soul. Edited by A. Jacob. Dordrecht; Boston: M. Nijhoff, 1987. More, Henry, G. A. J. Rogers. Henry More: Major Philosophical Works. The Cambridge Platonists. Thoemmes Continuum, 1997. More, Henry, Geoffrey Bullough. Philosophical Poems of Henry More, Comprising Psychozoia and Minor Poems. Manchester University Press, 1931. More, Henry, and Flora Isabel MacKinnon. Philosophical Writings of Henry More. New York: AMS Press, 1969. Norris, John. Reflections upon the Conduct of Human Life; with Reference to the Study of Learning and Knowledge. 2nd ed. London, 1691. Norris, John. Treatises upon Several Subjects. London, 1698. Norris, John. An Essay towards the Theory of the Ideal or Intelligible World. 2 vols. London, 1704. Norris, John, and Richard Ed Acworth. Philosophical and Theological Writings. The Cambridge Platonists. Thoemmes Continuum, 2002. Smith, John. Select Discourses. London: F. Flesher, for W. Morden Bookseller in Cambridg, 1660. [Includes “To the Reader,” by John Worthington and “A Sermon Preached at the Author’s Funeral, With a Brief Account of his Life and Death,” by Simon Patrick. ]; Reprinted with Introduction by C. A. Patrides. Delmar, NY: Scholar’s Facsimiles and Reprints, 1979; 2nd ed., corrected. Cambridge: Printed by John Hayes for W. Morden Bookseller, 1673; 3rd ed. carefully corrected. London: Rivingtons and Cochran, 1821; 4th ed. corrected and revised, by Henry Griffin Williams. Cambridge: University Press, 1859. Abridgments: “Discourse on Prophecy,” in Latin trans, M. Le Clerc, Commentary on the Prophets, Amsterdam, 1731; “Discourse on the Excellency and Nobleness of True Religion,” Glasgow, 1745; Lord Hailes, 1754; J. King, Cambridge, 1820; and most modern collections of Cambridge Platonist writings. Smith, John. “Will of John Smith, M.A. fell. Qu., dat. 3 Aug. prob. 12 Aug. 1652.” Cambridge University Library, Baker MSS, Mm.1.37, 215. Emmanuel College has a manuscript reporting Smith’s enrollment as a sizar there. There is also a manuscript list of the books donated to Queens’ upon Smith’s death. Sterry, Peter. “Various Manuscripts, MS 289-95”. Emmanuel College Library, Cambridge, UK. Sterry, Peter. Discourse of the Freedom of the Will. London, 1675. Sterry, Peter. The Rise, Race, and Royalty of the Kingdom of God in the Soul of Man. London, 1683. Sterry, Peter. The Appearance of God to Man in the Gospel and the Gospel Change. London, 1710. Sterry, Peter, and N. I. Matar, ed. Peter Sterry, Select Writings. New York: Peter Lang, 1994. Sterry, Peter, and Vivian de Sola Pinto. Peter Sterry—Platonist and Puritan. New York: Greenwood Press, 1968. Taliaferro, Charles, and Alison J. Teply, eds. Cambridge Platonist Spirituality. The Classics of Western Spirituality. New York: Paulist Press, 2004. Whichcote, Benjamin; Tillotson, John. A Sermon preached at the funeral of the Reverend Benjamin Whichcot, DD, and Minister of S. Lawrence Jewry, London, May 24th 1683. London, 1683. Whichcote, Benjamin, qeologoumhna dogmata: or Some Select Notions of that Learned and Reverend Divine of the Church of England, Benj. Whitchcot, D.D. London, 1685. Whichcote, Benjamin, A compendium of devotion, containing a treatise of prayer and thanksgiving: with morning and evening prayers for every day in the week, &c. Also a sermon of drawing nigh to God, by the late Reverend B. Whitchcot, D.D. London,1697. Whichcote, Benjamin, Select Sermons, with a Preface by Anthony Ashley Cooper, Third Earl of Shaftesbury. London, 1698; 2nd ed., London, 1721. Whichcote, Benjamin, Several Discourses… by B.W., ed. John Jeffrey, 4 vols. London, 1701-7. Whichcote, Benjamin, The True Notion of Peace in the Kingdom of Church of Christ. London, 1717. Whichcote, Benjamin, Twelve Sermons, 2nd ed., with a Preface by Anthony Ashley Cooper, Third Earl of Shaftesbury. London, 1721. Whichcote, Benjamin, The Works of the Learned B.W., 4 vols. Aberdeen, 1751; Reprinted New York, 1977. Worthington, John.The Diary and Correspondence of John Worthington, ed. J. Crossley and R.C. Christie. Chetham Society Remains 13, 36 and 114. Manchester, 1847, 1855, 1886.